to the Fellowship for Intentional Community? 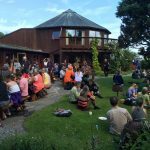 Intentional Communities: What is Being Learned? Humanity is facing unprecedented danger, mostly self-inflicted. What is being learned in intentional communities is applicable and relevant to the problems we’re facing. The FIC celebrated its 30th anniversary this year, and we’re looking ahead to the next 30 years and beyond. Intentional communities are experiments in community. They are living laboratories for cooperative, democratic governance models and social systems. They present a unique opportunity to help dismantle systemic oppression and privilege while working to dismantle them internally. 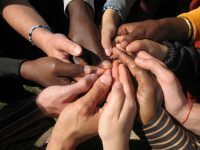 Intentional communities are about sharing. Sharing lives, sharing resources. Peacefully. Sustainably. When you share land, when you share a home, when you share livelihood, resources, relationships, it creates an especially satisfying and sustaining connection. This is what creating a new economy is all about. 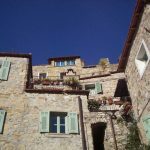 Home – sustaining ourselves and each other. We’re charting a path to a cooperative, just, and sustainable human presence on the planet. Please help us reach our end-of-year fundraising goal of $24K. Any amount is greatly appreciated. with FIC if you’re not one already. Benefits include 10% products and services, access to digital back issues of Communities magazine, and live participation in our monthly webinars. For gift giving, consider items from Community Bookstore or a gift card. I want more intentional communities to exist. I want lots more people to have the social and material support they have to offer. I want models for consumption and waste that won’t end with us killing ourselves. I want people changing their relationships with each other and changing the world at the same time. 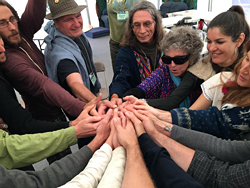 I work for the Fellowship for Intentional Community because I believe that intentional communities make a difference in the world, and I believe we can make a difference for the people living in and learning from intentional communities. advance cooperative living models.A gift of $30, $50 or $100 will help the FIC finish off its 30th birthday in the black, and prepare it for a busy year to come. 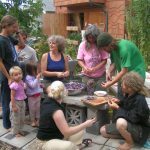 Your donation will help the FIC meet its budgetary goals and financial needs, but it also keeps these vital platforms alive and running to showcase intentional communities as demonstrable models for a healthier global society. The board and staff of the FIC recently held intensive retreats to plan out the year ahead. We’re committed to advancing solutions and encouraging dialogue to get other groups and individuals to see themselves as part of a movement and get them directly involved in supporting and forming intentional communities.